Fobus Holsters are the next wave in tactical holsters featuring passive retention with rapid deployment, are combat tested, perform in all situations and are virtually indestructible. Fobus holsters and pouches were designed and made especially for the Israeli security services and SWAT teams. Their holsters are mold injected with RX18 polymer, a compound of polymers designed for durability and high performance in tactical use. By using a passive retention system, a safety strap or mechanism is no longer needed, their design ensures safe carrying of the gun, accurate fitting and a quick draw when needed. This unique Fobus Roto Holster rotates 360 degrees and adjusts easily for cross-draw(bodyguard/driver), small-of-the-back, and strong-side carries. A 100% lifetime guarantee stands behind each and every Fobus Roto Holster. Designed with a paddle attachment so removal of belt is not required. Best holster I own. Very happy with the purchase. Great product, always great service. Fits my Glock 41 just fine. where is the release mechanism and how do you engage it? also, when you rotate the 360 degree does it click into place or does it rotate freely? Fobus holsters utilizes a passive retention system that allows for rapid presentation. Due to the unique passive retention system the only point of contact your pistol makes with the holster is where the trigger guard meets the frame. Clicks into place when adjusting the angle of the draw. Well this item fit the s m sd40ve? Select 'Smith & Wesson Enhanced Sigma VE' as your fit. How does this holster lock? How does it unlock? will it fit a Taurus 65 .357 .38 magnum revolver? 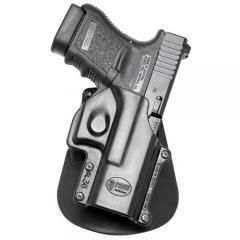 This holster features a passive retention system meaning no button to engage for drawing. The holster is molded to the trigger guard area to secure the weapon. Yes it will fit the Taurus 65 revolver. Will a sig sauer P229 equinox 40 cal with rails work in this holster? You can select "Sig Sauer 229" as the fit.